Join Adventure Café for a weekend exploring the wilds of the untrodden and lesser discovered Lakes. We shall visit the famous tops of Blencathra and Skiddaw - but also along the way we shall visit some lesser known peaks - fanning out from Keswick and exploring some of the areas more tranquil peaks. We shall overnight in a special 'secret' wild camping spot - where we hope to avoid other trekkers - whilst enjoying the unspoiled nature of the Lakes. A wonderous wild challenge through the Lakes - with an opportunity to really get to grips with England's most famous outdoors playground. Staying overnight high in the fells, we shall count no less than 9 Fell tops on this roundabout route in the Northern Fells - Skiddaw and Blencathra being amongst the Lakes most celebrated peaks, whilst others are almost unknown by the masses. Our overnight in the valleys of Matterdale should prove a memorable experience - and a real golden oppoortunity to commune with nature. And to prepare your own dinner over a gas flame! This is a special weekend - and doubtless one that you won't forget in a hurry! Adventure Café will take the strain of organising all the tricky bits - all you have to do is turn up with your own personal items - and away we go - high into the Mountains! 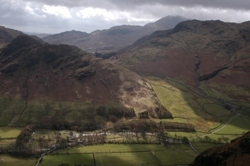 Travel to Lake District (Keswick) and stay overnight in comfortable bunkhouse accommodation. Evening briefing with your leader, and get your equipment ready for the following day. Please ensure you arrive by the very latest 19:00. Breakfast - 06:30. Early morning start to explore the Fells of Skiddaw and beyond - before descending into a tranquil and wild valley beside a running mountain stream. Early evening we shall find ourselves a nice sheltered spot, to pitch our tents, with access to running water. 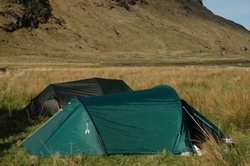 Your leader will brief you on the etiquette of wild camping and ecology in the mountains. Cook dinner (dinner and breakfast provided by Adventure Café as part of this event) and enjoy a very special evening! Again – we shall start early – trying to cram in a full day. After breakfast and packing down our tents, we get out this time into the wilds of Blencathra before dropping down into Keswick once more. We’ll expect to be wrapping up by about 15:30 - 16:00, ready for our return home…. exhausted, but with great memories of a Lakeland less explored! Returning to civilisation will be a bittersweet experience - enjoying the creature comforts, but sad to leave behind the beautiful wilderness! We’ll be staying in comfortable bunkhouse style accommodation for night 1, with bedding provided, but please do bring your own towels. We’ll provide breakfast, but you need to bring towel, and wash kit. Our accommodation is close by to evening meal venues, and for some last minute food shopping for lunches – spar / cornershop. It’s also conveniently located for our walks… handy! Adventure Café will provide mountain tents for you for the wild camp - which will be suitable for this trip. They are new, in good condition, and fairly lightweight - making your job in carrying them slightly easier! If you have you would like to bring your own tent then you are more than welcome (as long as the tent is reasonable for the type of terrain/weather), we would just ask if you could share to reduce the footprint of tents on the mountain. This is a self sufficient itinerary meaning you will be carrying your own equipment (tents shared in pairs). A high level of fitness is required for this challenge. You must train and be able to carry this weight for yours and the groups safety. Guiding, accommodation (bed and breakfast in bunkhouse style accommodation for night 1), tents and stoves for night 2, evening meal and breakfast whilst wild camping. Transport to start of event, lunches, dinners. Personal equipment, Transfer from Keswick to start of event, and back at the end of the event. You will be carrying substantial weight with your overnight equipment. Please ensure you have trained with this equipment and able to conduct the length of day with this additional weight.